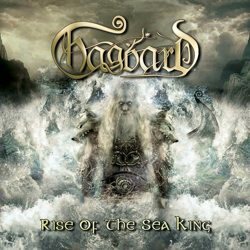 Hagbard is a new Brazilian epic folk metal band from Juiz de Fora that has recently released its debut full-length album “Rise of the Sea King“. The band was formed in 2010 and in 2011 their demo EP “Warrior’s Legacy” was out. They grew in popularity in their local scene and soon started working on their full-length. Before its release though, Hagbard published the 2-track single “Lost in the Highlands” as an appetizer for the forthcoming album. “Rise of the Sea King” was recorded in Brazil, mixed and mastered in Sweden and finally released by the Russian label SoundAge Productions in November 2013. Quite a long journey for their music! Since its beginning, Hagbard combined folk music with various metal genres, influenced by fantasy and mythological themes by many different cultures. This has an obvious impact in the diversity of their music, but Hagbard seem skillful enough to mix all these various elements in a multidimensional and at the same time solid result. Their compositions move from epic blackened metal and bombastic symphonic epic metal songs, to folk metal, happy drinking dancing songs and acoustic epic ballads. They prefer to give a separate identity and mood to each song, rather than changing styles inside the compositions, something that makes the album more interesting and easy to listen. They have a “generic” folk atmosphere in their songs, since they borrow elements from traditional music of various origins, trying to combine all of them in a single fantasy mood. They are a very technical band, with great guitar lines, ranging from epic rhythmic riffs to melodic leads and amazing solos. The band has found a great balance in its orchestrations and despite the extended use of synths, their guitars are still very dominant in their sound. Beautiful flutes, tranquil acoustic guitars and enchanting violins, help them create a magical atmosphere. Of course, vocals couldn’t be the exception in the rule, so the band experiments with various singing styles; typical black metal growls and epic clean male vocals are accompanied by nice choirs and amazing guest female vocals in a couple of songs. All of the lyrics are in English, included in the CD booklet. “Rise of the Sea King” contains 10 songs, with a total duration a little over 37 minutes. I think they still need a little work in order to sound more natural and less synthetic (less “echo” in the orchestrations). Of course the production quality and sound level for a first effort are more than satisfying, it’s just that the band has raised my expectations. Fans of epic folk blackened metal better give them a listen! The album is released by SoundAge in a standard jewel-case edition CD, with 12-page booklet illustrated by Jobert Mello of Sledgehammer Graphix. The band is also trying to release the album in Brazil. You can visit their official pages below and get a taste of their epic music.